The door of the Germans is a remnant of the old medieval walls of Metz, France. The building dominated the eastern wall line of nearly 1200 m from the gate to the door Mazelle Sainte-Barbe. 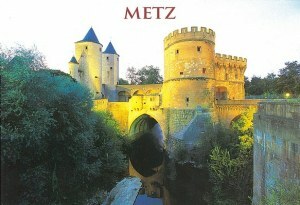 The door of the Germans is part of a wider heritage group, on the whole of the medieval ramparts of Metz.